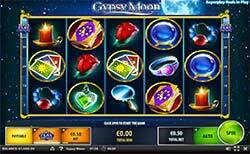 Gypsy Moon Slot by Spielo Gaming - Free at Slotorama! Review of: Gypsy Moon Slot for free play at Slotorama! Watch as the stars align for you in the new 5-reels Gypsy Moon slot by Spielo Gaming with 243 Ways to Win. This rewarding game is charged with a bonus features awarded to you by a mystical Gypsy who might be able to tell you what fortunes await your future. This game is popular in land based casinos and is not ready for online slots play! This spellbinding game is set under the natural magic of the night sky. Beneath the moon and stars lie symbols like a crystal ball, book of magic, red rose, tarot cards among others. All of these symbols when lined up in a line win can result in some hefty wins. Couple that with features like the wilds and free spins bonus and you have got yourself a winner. In fact, betting $0.50/spin we managed to get $62 above our starting balance in less than 3 minutes of play. Now that’s a decent return and we hope that you get the same luck! Gypsy Wilds – The magical gypsy lady is the wild symbol and substitutes for all other symbols except the astrological scatter. You can find wilds on every reel except the 1st to complete wins. Free Spins – Land three or more Astrological scatter symbols on the reels to win the free spins bonus! Once you’ve triggered this round, you’ll have the choice of four different rounds including 7 spins with a 5x multiplier, 10 spins with a 3x multiplier, 15 spins with a 2x multiplier or 30 spins with a 1x multiplier.